The right piece of technology can add a lot of spooky atmosphere to any Halloween, whether you’re throwing a big party or just getting ready for a horde of trick or treaters. Recently here on Techlicious, we discussed 5 fun Halloween gadgets for under $22. 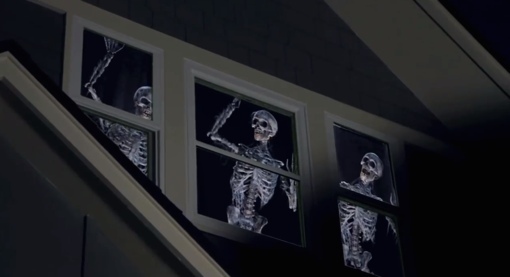 But if you’re willing to spend more, the folks at AtmosFEARfx have created one of the coolest decorative ideas for the holiday I’ve seen: Why not use a video projector to place a haunting, animated digital scene right in your home’s front window? It’s all quite easy to set up. First, choose the AtmosFEARfx video that you’d like to feature. There are ten different DVD video offerings to choose from with many different themes, from a “Night Stalkers” homage to 80s horror movies to the family-friendly “Jack-O’-Lantern Jamboree” or “Bone Chillers” with fun animated skeletons. You then connect a DVD player or computer with DVD drive to a digital video projector and project the fun onto your walls, the floor, a specially set up screen or onto sheer window blinds to scare the neighbors. Of course, buying a brand new video projector can be a major expense. One option is to purchase a device like the $359 Epson PowerLite Home Cinema 500, with 2600 lumens of output and 800 x 600 SVGA resolution. Otherwise, you might want to consider purchasing a similar used projector off of eBay – there are plenty of older devices there that will work just fine (assuming they do work!) for $100 or less. You can also play the AtmosFEARfx on a television, but let’s be honest – that’s not going to be nearly as fun. Want to learn more about this spooky high-tech Halloween idea? Start by checking out the short video below that shows off the various AtmosFEARfx videos and setup options. To take a look at the full line of $39 AtmosFEARfx videos, visit the company’s website. This is Definately a cool use of projectors, recently saw a review of a Epson vs a Pico projector though. Seems like Pico’s would be a cheaper route and they’re not far off in image brightness/quality.